Your credit cards, or popular PayPal service or also Bank or Certified Checks or Money Order. Our online store uses secure infrastructure so that your payments are processed through a reliable and secure gateway. Also, we have attempted to offer you intuitive information about these options during the check-out process. We hope you will find your check out experience easy and enjoyable. • Google Checkout: You have added advantages of masked e-mail, single sign-on, better privacy promise etc. Recently, the majority of consumers consider a secure environment to be the most important factor when shopping online. Security was cited as the No. 1 priority by 91 percent of participants, with sales specials on the Web site rating second. With just a click of the mouse, shoppers can buy nearly any product online - from groceries to cars, from insurance policies to home loans. The world of electronic commerce, also known as e-commerce, enables consumers to shop at thousands of online stores and pay for their purchases without leaving the comfort of home. For many, the Internet has taken the place of Saturday afternoon window shopping at the mall. We have instituted the most secure technology to encrypt your data so that you are guarded from unauthorized use. With the secure payment gateway and its advanced security features, it is easy to use a credit card to make your purchase. We accept all major cards including, Visa, MasterCard, Discover and American Express. There is no surcharge for using your credit card to make purchases with us. Please be sure to provide your exact billing address and telephone number-the address and phone number your credit card bank has on file for you. Incorrect information may cause a delay in processing your order. 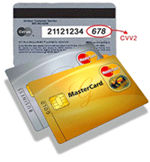 Your credit card will be billed only upon verification & production of your order. Please do not send cash with your mail orders. For added security, you will asked to choose one of the following during the check-out process along with the request to provide the 3 or 4 digit security code as guided in the image above.